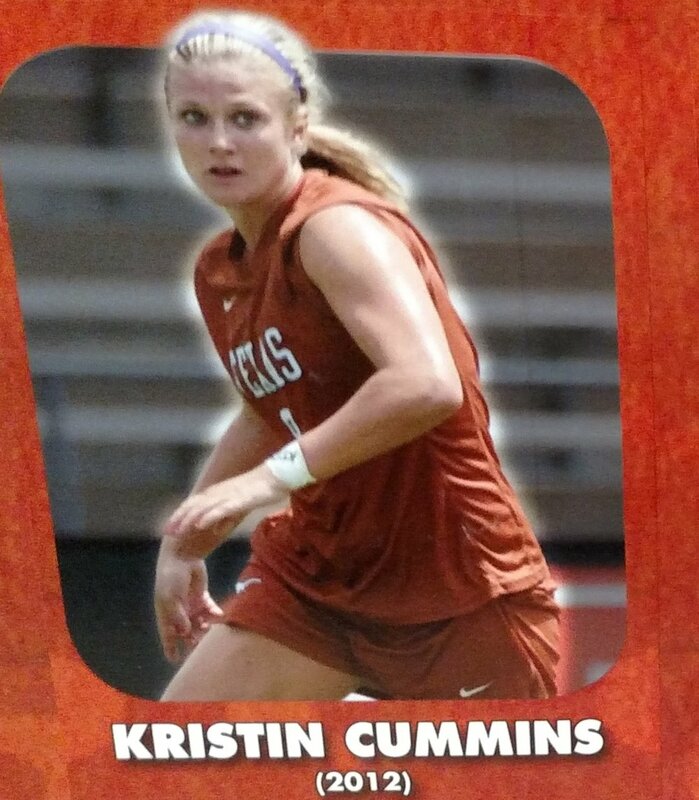 UNLIKE TEXAS BASKETBALL, FOOTBALL, TRACK, AND BASEBALL THERE ARE VERY FEW BOOKS DEDICATED TO LONGHORN women's soccer. I HOPE WITH TIME THIS SITE CAN ADD SOME HISTORICAL INSIGHT AND TELL THE COMPELLING STORY OF LONGHORN soccer . The link below is to the Texassports.com site. This site has all the data on UT women's soccer. After competing as a club for several years the soccer team gained varsity status this year . The team finished second at the TWISCC playoffs with Monica Moore making the All conference team. four players drafted into Women’s Professional Soccer, three of them as top-25 selections (Kasey Moore/15th/2008, Stephanie Logterman/20th/2008, Jill Gilbeau/22nd/2008, Kelly Wilson/44th/2004). Please visit the "Pioneer" navigation page and click on Dang Pibulvech to hear his story. First season the soccer team was 6-1 at home. Heather Bethard collects UT's first Division I goal against Pepperdine. Freshmen take 10 spots on the 1994 team. First division I win is against Cal Polly. First Division I home win is against Texas Tech. Jill Cook records the first Division I assist against Texas Tech. Jaime Strong holds the career record for saves at 473. Jaime Strong records her seventh shutout of the 1994 season with a 4-0 win over Arizona on Oct. 30 to set the school single-season record for shutouts. Jill Cook holds the record for the fastest score to start a game at 10 seconds. Carol Finch is one of three players who are tied for the Texas record for 4 scores in one game. Texas sets single-game records for points (36), goals (12), assists (12) and largest margin of victory in a 12-0 win over Pittsburgh. Carol Finch sets the UT single-game record with four goals in the Longhorns' victory over the Panthers. Rachael Safirstein is the first Texas player to be named to Soccer America's National Team of the Week. Alanna Makinano is the first Longhorns player to be named a Big 12 Conference Player of the Week. Katie Baruth is one of three players who are tied for the Texas record for 4 scores in one game. Coach Petrucelli brings lightning , a Rainbow, and some rain. The construction of Mike A. Myers Stadium and Soccer Field is completed. As of 2015, the Longhorn women's soccer teams have compiled a 116-35-16 (.743) in 16 seasons in their new home which includes four undefeated home campaigns in 2002, 2007, 2008, and 2013. The First game in the new stadium was a 1-0 victory in August of 1999 against Oklahoma. Nicloe Ramirez made the first goal . Cami Varnadore is the first UT defensive player to earn a Big 12 Conference Player of the Week honor (no picture). Kylee Wosnuk is the first Longhorns Player to earn a Big 12 Newcomer of the Week honor. Texas records its first victory in Big 12 play with a 3-2 win over Colorado. Texas secures its first-ever Big 12 Conference Championship. 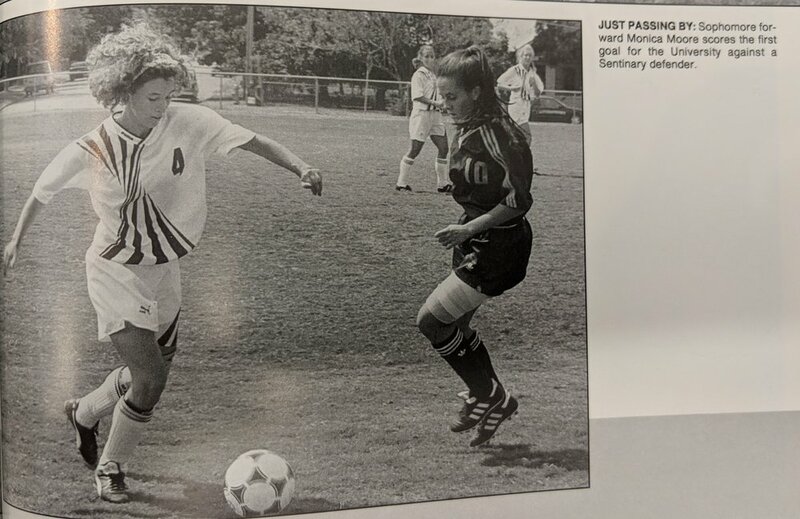 Soccer Honors is 2001 are below - more information to follow. Kelly Wilson is the only Longhorn to receive the Big 12 Player of the Year award . 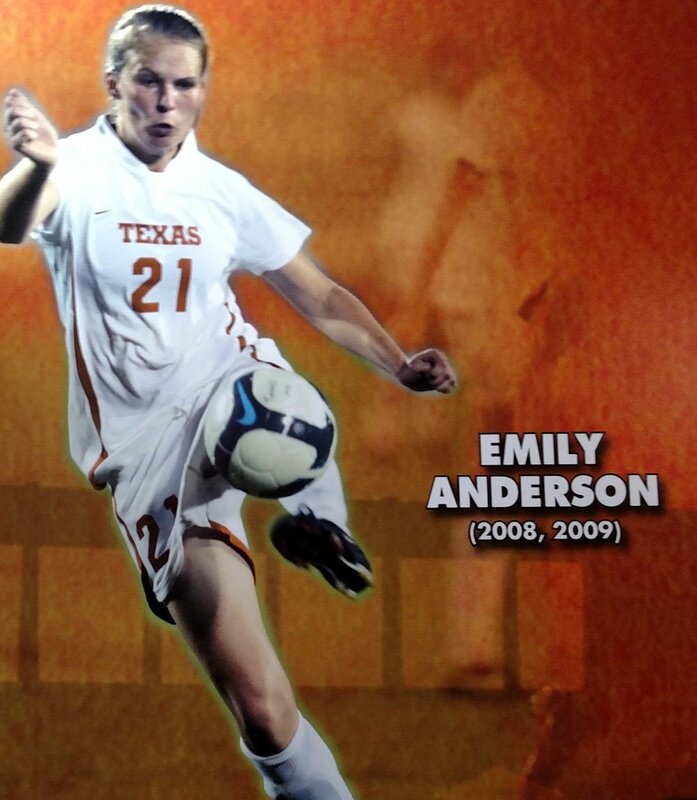 She holds the seasonal record at texas for points scored (46), goals scored (16), and assists (14). Kelly Wilson is named to the Big 12 Conference 10th Anniversary Team. Kelly Wilson Receives Freshman All- America Honors And Is The Only UT Women's Soccer Player To Be Selected To The USA National Team. Kati McBain- First Texas player named Rookie of the Year in the Big 12; had 6 points against Texas Tech in two games. Selected to the All-Central team. This team ties the 2004 team for the record for most points scored (172) in a season. 2003- 12-9 record Coach Chris Petrucelli. Kelly McDonald Holds The Texas Career Record For Goals (46)and she finished her career with 4 league offensive players of the week honors. McDonald finishes her UT career with four league offensive players of the week honors. Texas defeats No. 6 Texas A&M by a score of 2-1 in double overtime to give the UT soccer program its first-ever triumph over the Aggies. Kelsey Carpenter holds the seasonal records for shots (109) and is tied with two other players for game winning goals (8). Kelsey Carpenter is a All-American and team MVP. group. Caitlin Kennedy makes the Soccer America All-Freshman Team and is a Parade All American. Kasey Moore in Big 12 Freshman of the Year. Kasey Moore makes the NSCAA First-Team All-America team . 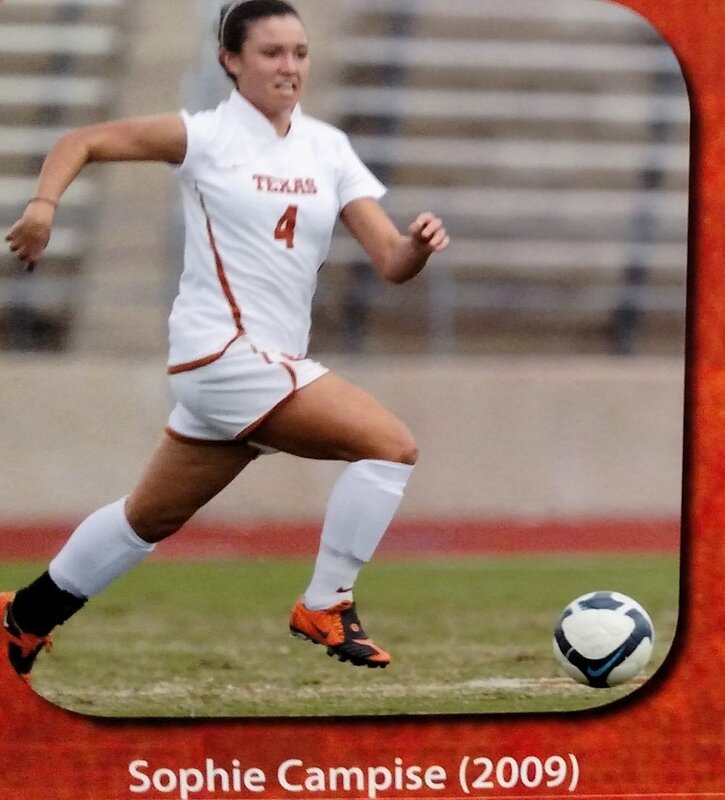 She is the only player in Longhorn women's soccer to win the honor three years in a row. Kasey Moore holds the Texas career record for matches started (91) and is Big 12 Defensive Player of the Year in 2007 and 2008. Four Longhorns were named to the Big 12 All-Conference team. Senior captain Carrie Schmit , junior forward Kelsey Carpenter , sophomore defenders Stephanie Logterman, and Kasey Moore were named to the first-team. The Longhorns win their first Big 12 tournament and advance to the 3rd round of the NCAA tournament. 10 Longhorns are named to Academic All-Big 12 first team. Amy Burlingham ,Kelsey Carpenter Priscilla Fite, Stephanie Gibson , Jill Gilbeau Karen Haight, Leslie Imber, ; and Stephanie Logterman. Last year as a junior, I applied for an internship with Goldman Sachs through the on-campus recruiting program here at The University of Texas. I interviewed in Austin with a lot of people and then traveled to New York for a day to interview with six more people. After I found out I made the cut, I was given the internship at the beginning of the summer. I worked 10 weeks in the sales and rotational program, spending time with different desks within that division while learning about the company. I met as many people as I could and even helped out when possible. The main purpose of the internship was to see what life would be like if you worked for Goldman Sachs. Prior to this internship, the closest I came to a full-time commitment (outside of playing soccer at one of the best Division I programs in the country) was a minimum wage, fast food job a few summers ago. I think the recruiters appreciated that I had little-to-no working experience because of my involvement with soccer, my grade point average and my personality. That combination helped me through the initial screening process and into the interview pool. From there, the people who selected the interns looked for people who they felt had a good personality to fit with the company and the program. When I left for New York City, I knew no one there. I had never been to New York, other than for my interview, but even then, I flew in and out the same day. When I accepted the position I was definitely going on a leap of faith. I met a lot of fun people in Manhattan including a few from UT. Actually, I met a lot of Texas students there. In our program were a number of students mainly from Ivy League colleges and other programs on the East Coast. I lived in a dorm off Wall Street within walking distance to work. Texas junior goalkeeper Dianna Pfenninger set the UT school record with her 29th career win. In September 2008 the Largest Crowd ever watched Texas and Texas A & M compete. 5585 fans saw this game in a year the average attendance was 1,068. The game ended in a tie. This Team Holds The Seasonal Record At Texas For Most shutouts (11), fewest points allowed (40), and consecutive shutouts (4). Kelly McDonald is tied with Kelly Wilson and Kelsey Carpenter with Texas career game-winning goals (13). Petrucelli was reprimanded for pursuing and then confronting game officials near midfield after the completion of the Texas at Nebraska match on October 3. Soccer defensive standout Jill Gilbeau received the Janet Hauber Academic Excellence Award given to the female student-athlete who excels in the sciences. Gilbeau was a biology major who was named to the ESPN Magazines Academic All-District First Team and to the Big 12 Academic First Team. She also received soccer's Lowe's Most Improved Award. 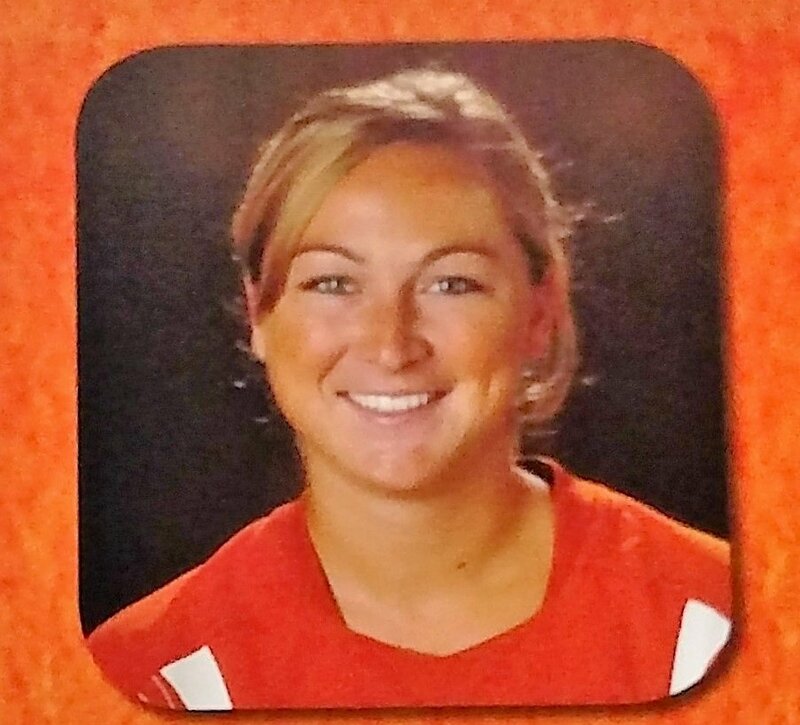 As of 2015 Angela Kelly has a 31-24-8 record at Texas. Her overall career record is 191-108-28 with 12 of those years at Tennessee. At Tennessee she is credited with 10 NCAA tournament bids, 5 sweet 16 appearances, 4 SEC tournament titles. 3 SEC titles, and 3 time SEC coach of the year. The Texas Soccer program received the National Soccer Coaches Association of America (NSCAA) Team Academic Award for the 2011-12 academic year. 2014 is the end of Soccer history on this site. Future information will be added at the appropriate time. Playing soccer for Texas link from TexasSports.com is below.